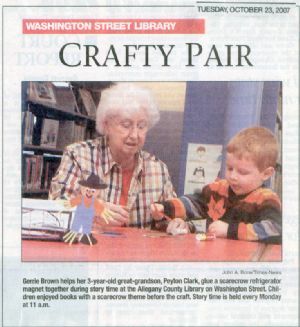 Genie Brown helps her 3-year-old great-grandson, Peyton Clark, glue a scarecrow refrigerator magnet together during story time at the Allegany County Library on Washington Street. Children enjoyed books with a scarecrow theme before the craft. Story time is held every Monday at 11 a.m.